With one caveat: this is not meant to be remotely comprehensive, because I don’t know enough to give a comprehensive overview of Chicago’s population trends since 1930. 1930s. Population at the end of the decade: 3,397,000. Up 20,000. By the 1930s, the trends that we think of as beginning in the post-WWII era are actually already quite visible: depopulation of the older neighborhoods, and relatively rapid growth in outlying neighborhoods that resemble car-oriented suburbs. The trends are muted, though, because the economic situation means there isn’t much construction. 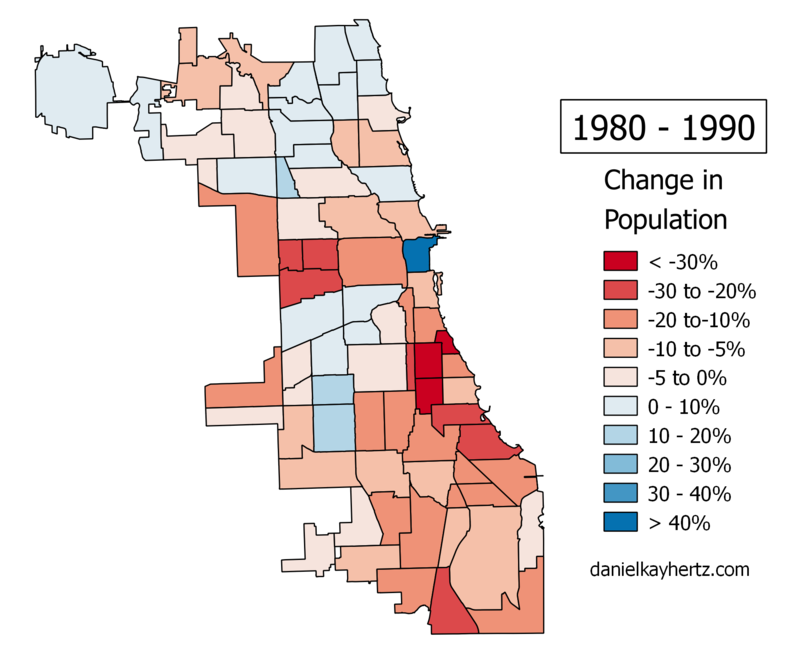 To be honest, I’m not quite sure what’s going on in the Loop and South Loop, which both lost well over 30% of their populations. Comments would be appreciated. 1940s. Population at the end of the decade: 3,621,000. Up 224,000. As the economy comes back, those greenfield suburban-type neighborhoods explode, largely with single-family owner-occupied homes subsidized by the newly created federal mortgage system. Many inner neighborhoods continue to lose population, although interestingly the older lakefront neighborhoods appear to be generally stable. By far the most interesting, and ominous, part of this picture is the Black Belt, or what’s now called greater Bronzeville: the stretch of lakefront neighborhoods just south of downtown, whose populations boomed between 40 and 75% during this decade. That’s because in the 1940s, the Second Great Migration began, and hundreds of thousands of black people arrived in Chicago from the South, only to find that racial segregation – which only a generation or two before had existed in a much milder form – had calcified to the point that their only option was to live in the ghetto. Since the white people around the ghetto weren’t letting it expand at this point – people who tested the boundaries were liable to have their homes bombed – the Black Belt simply became horrifically overcrowded. Another way of putting that, of course, was that there was an extreme housing shortage for black people, since there wasn’t much new building within the ghetto, either. Those of you who read this blog may guess what comes next: unlike the current dynamic, in which housing in black communities is usually very under-priced thanks to a lack of demand, because non-black people refuse to live there, black housing in the 1940s was radically over-priced. Black families would routinely pay significantly more than white families for smaller, older, less sanitary, and more dangerous apartments. 1950s. Population at the end of the decade: 3,550,000. Down 171,000. The ghetto breaks. In part, this is by design: the late 1940s and 1950s begin the era of large-scale urban renewal, which is largely focused on the areas near the Loop occupied by people that City Hall and downtown business leaders consider undesirable. Mostly, this is black people. Massive displacement on the northern end of the Black Belt is actually opposed by whites on the far South Side, who anticipate – correctly – that there’s simply nowhere for those black people to go within the existing ghetto. The Lake Meadows project began what would eventually be the total destruction of a contiguous mile-long section of tens of thousands of black homes and businesses. This was completed by the early 1950s. The spread of black families, a pent-up demand for housing because of low rates of construction from 1929 through the end of the war, and the creation highways to the suburbs produced an exodus from nearly every built-up neighborhood in the city. Areas with available sites for new construction along the edges of the city still saw huge population gains. 1960s. Population at the end of the decade: 3,367,000. Down 183,000. Basically the same as the 1950s, except black people had by now been forced into a second large ghetto on the West Side, and white people began fleeing in massive numbers there as well. The two community areas that saw modest growth in the heart of the Black Belt, surrounded by expanding waves of severe depopulation, are where the five-mile-long string of segregated, high-density public housing towers were built. Also in the 1960s, Mayor Daley bulldozed much of the old Near West Side, including Little Italy, to build the campus for the University of Illinois at Chicago. Residents further west, in Garfield Park, had requested that the university be placed in that large park, which would have a) spared tens of thousands of people having their homes bulldozed, and b) potentially created a social and economic anchor in a neighborhood that was clearly in the path of ghettoization. But Daley declined. 1970s. Population at the end of the decade: 3,005,000. Down 362,000. The wave of extreme depopulation following ghettoization spreads outward to places like Englewood in the middle of the South Side and West Garfield Park on the far West Side. 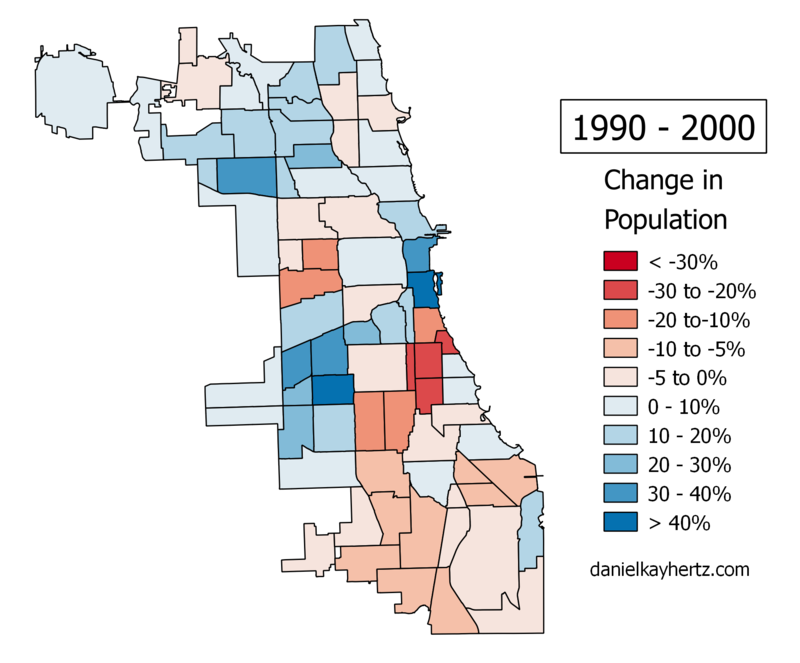 Also notable, though, that Latino immigration is by now leading to population gains along a sliver of the Southwest Side, through Pilsen and Little Village. 1980s. Population at the end of the decade: 2,784,000. Down 221,000. Depopulation continues on the South and West Sides, especially in and around areas where black people have moved. Latino immigration expands the area of growth on the Southwest Side. 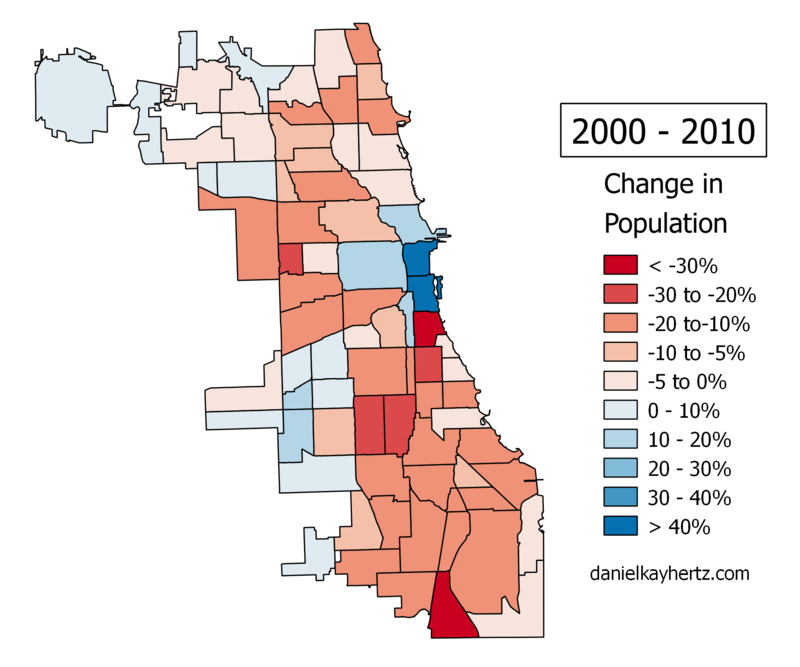 Large parts of the North Side are also stabilizing after several decades of decline, especially where there are immigrants. 1990s. Population at the end of the decade: 2,896,000. Up 112,000. The first increase in population since WWII. There’s a huge increase in the number of Latinos, and they move into neighborhoods throughout the Southwest and Northwest Sides. Downtown and the north lakefront neighborhoods see rapid gentrification, although outside of downtown, restrictive zoning prevents that gentrification from turning into significant population gains. Hyde Park and South Kenwood – the light-blue areas along the south lakefront – have also stabilized. Meanwhile, the public housing projects built in the 50s and 60s have officially been declared failures, and the Hope VI federal initiative gives cities an incentive to redevelop those projects as mixed-income housing. The Chicago Housing Authority begins letting the projects empty out before demolishing virtually all of them in the next decade; I suspect that goes a long way to explaining the continuing rapid decline in population in greater Bronzeville. Early this decade is also the peak of the crack-era crime wave, and Bronzeville, not coincidentally, is perhaps the single most dangerous place in the city. 2000s. Population at the end of the decade: 2,696,000. Down 200,000. Massive construction and population growth downtown is more than offset by declines virtually everywhere else in the city. The wave of Latino population growth has crested and begun to move out into the very outer neighborhoods and suburbs. Blacks leave the South and West Sides, including many who are displaced when the last of the public housing towers are torn down, and no one comes to replace them. Meanwhile, restrictive zoning on the North Side means that even as places like Lincoln Park and Lakeview reach all-time highs in prestige and median income, new construction mostly takes the form of luxury buildings replacing older buildings with roughly the same number of units. These neighborhoods remain 20% to 60% below their peak populations. 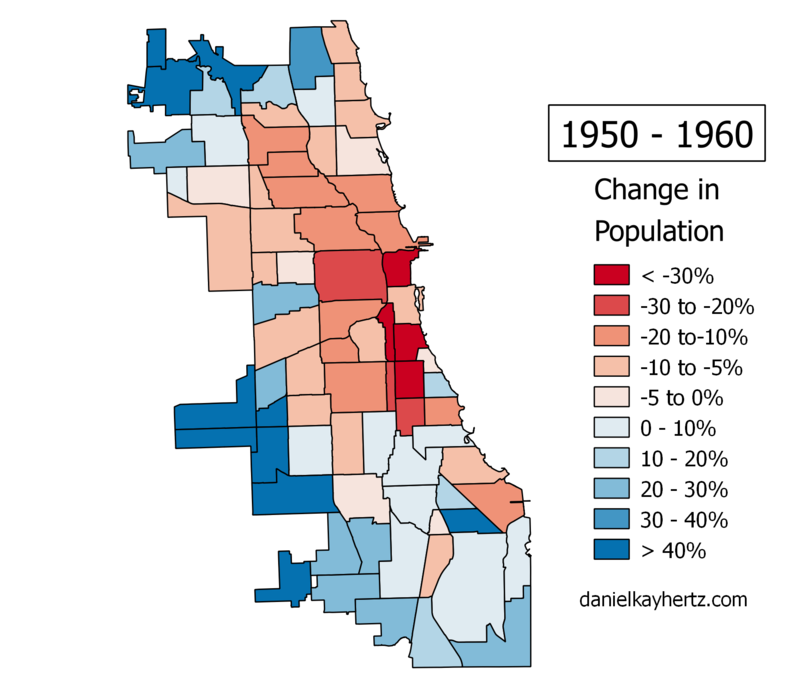 Nice summary of 8 decades of often-turbulent change in Chicago. That seems like a key point: if there’s displacement of population in gentrifying neighborhoods, it may be more accurate to point to restrictive zoning as the cause, rather than the influx of new, wealthier residents. The other thing that always confounds analyses of population change is ever shrinking average household sizes. The aging of the population, the growth of the number of single person households, the decline in the number of households with children, the smaller average sizes of families with children, etc, all exert downward pressures on population totals even if the housing stock is stable (or even increasing modestly). It would be interesting to see the same maps by numbers of dwelling units. Yeah, I was somewhat remiss not to mention smaller household sizes. That’s important. As for gentrification – yeah, restrictive zoning would seem to play a big role in pushing people with social capital further and further from the original center of wealth. 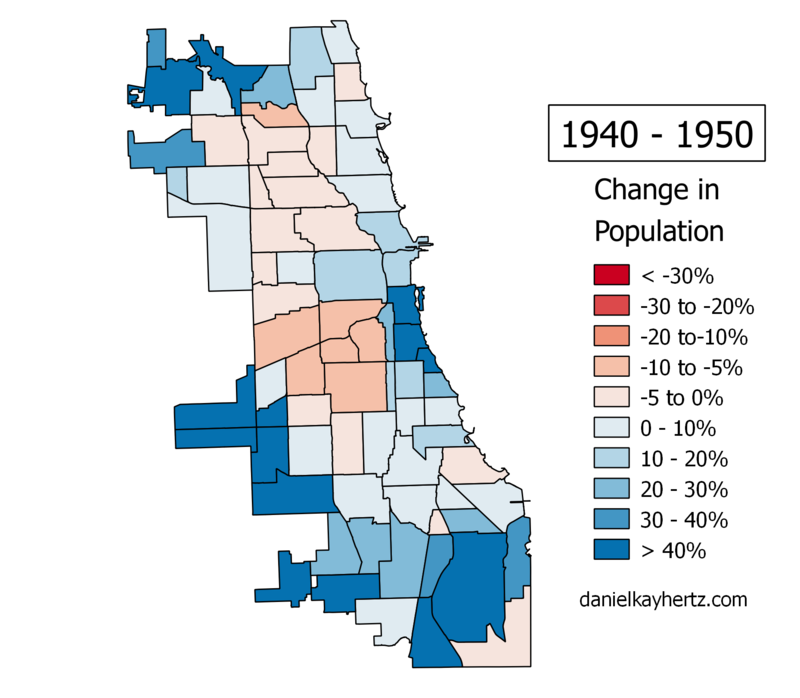 As for the population decline of the Loop and the South Loop in the 1930s, this map suggests that all the census tracts in both community areas had high vacancy rates in 1934. http://www.lib.uchicago.edu/e/collections/maps/ssrc/G4104-C6E73-1934-U5.html I can’t find census tract level population data from 1930, so I can’t figure out which parts of the neighborhoods saw the greatest population decline. 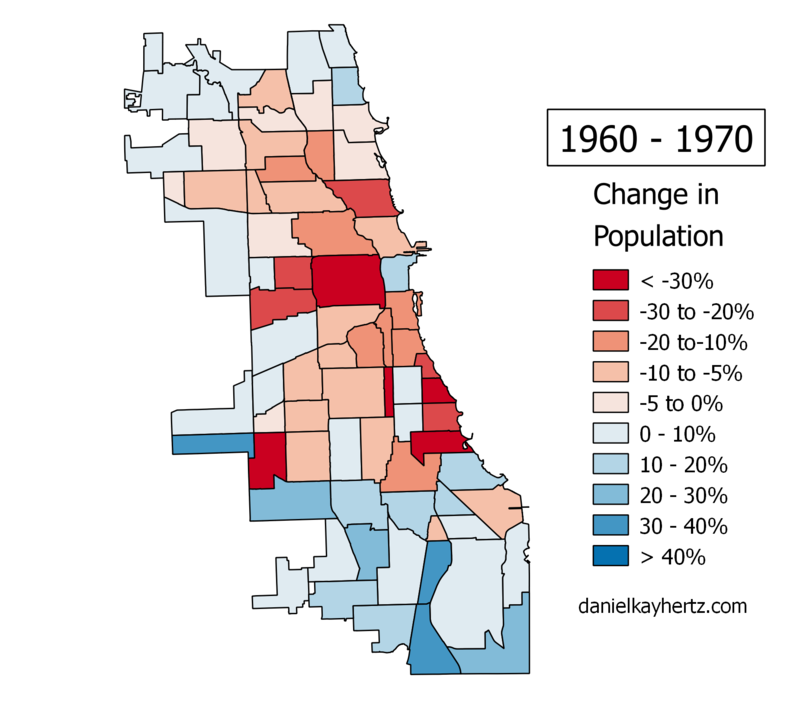 From the Social Explorer data, it looks like both community areas were predominantly white (except for a small sliver west of State Street and south of Roosevelt), so race relations probably didn’t contribute to the decline. My best guess is that neighborhoods were considered “slums” and people left by choice and not because of an urban-renewal-like project. This article http://www.encyclopedia.chicagohistory.org/pages/877.html supports that theory. 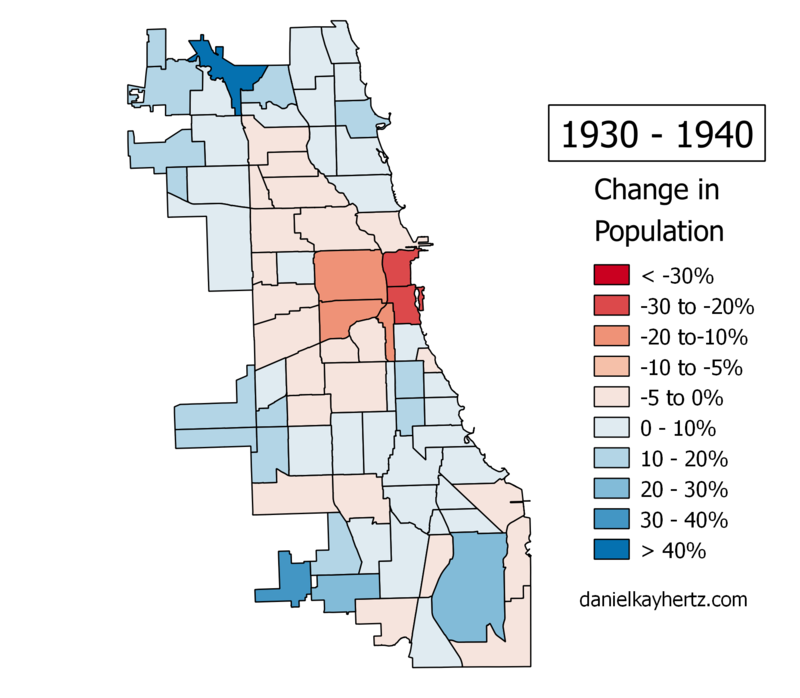 Also, both community areas had low populations to being with (Loop had 7,851 in 1930 and Near South side had 10,416 in 1930), so the population declines don’t reflect a huge trend. Yeah, I sort of figured that last part was probably it – there weren’t many people there to begin with. Still, ten thousand people is ten thousand people. Who were they? I was going to comment similar to Benjamin but he did a good job summarizing. It is only in recent decades that the Loop became a residential area. 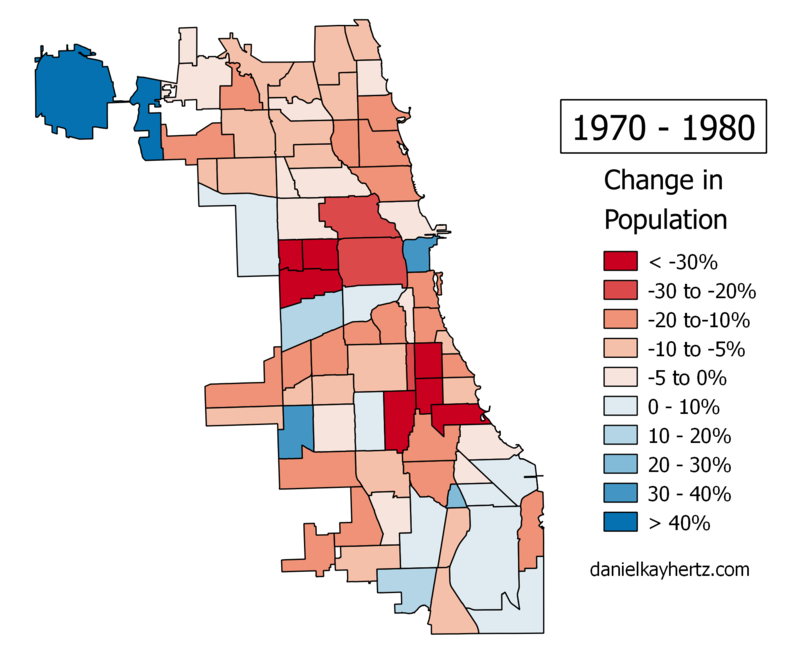 The population of the Loop was historically low compared to other areas. It was largely factories, warehouses, rail yards, office buildings, theaters, and hotels. Interstingly 1940-1950 roughly coincided with the construction of the red and blue line subways.